***IMPORTANT:*** The order of the pics are DIFFERENT every time the game is installed. This means that for any particular level, you’ll probably see pics that are different from the ones in these solutions. 3)Click here to see all the pics to find a specific set of pics. 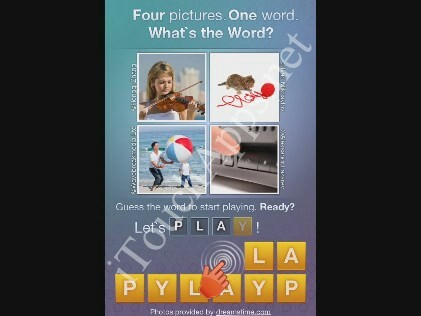 Below are all answers to “What’s the Word”, an ios game developed by Redspell. The picture on this page contains the answer to the “preliminary level”, or the example level that serves as a tutorial – the answer is “PLAY”. Hope you enjoy the game! What’s the Word Answers: Level 261 – WINTER – Ski lift, woman in pink jacket with red mitten, an icicle, white horse pulling a white carriage through snow. What’s the Word Answers: Level 264 – EXERCISE – Person jogging by the lake, the binding of a note book in pink, soldiers, a side of a building with empty space in front. What’s the Word Answers: Level 265 – PREDATOR – A cat, an eagle, a bald eagle, a leopard or cheetah. What’s the Word Answers: Level 276 – ENERGY – Train hauling coal, oil rigs, wind mill, solar panels. What’s the Word Answers: Level 314 – BALLOON – Hot air balloon shadow on the fields, an orange ‘JUST MARRIED’ balloon, a speech bubble, ?? What’s the Word Answers: Level 404 – CORK – Brunette girl plays peek a boo, a man in green hides a bouquet of flowers behind his back, push pins on a cork board (blue, green, and red), a red paddle? What’s the Word Answers: Level 429 – FARM – A red barn beside a grey silo, a cow, a dirt road, tractor? what does dirty snow a thermometor with a stocking hat on water running over a hand and red cracked glass have in common? what word links alarm dry out and chain? Hi Kaety! It depends on which browser you have. If you’re using Firefox, choose “Find” from your menu and type in a 1-2 word description of any of the pics in that level. If you’re using Internet Explorer, go to the “Edit” menu and choose “Find on this page”. For Chrome, click on the menu and choose “Find…”. Good luck and sorry for the extremely late reply! » What’s the Word: Are You Smart Enough?